VentaFax Business - A Color Fax and Answering Machine Software. VentaFax is a full-featured fax and answering machine software with color fax support. It sends and receives faxes and turns your PC with a fax modem into a versatile answering machine with remote control and email integration. You can retrieve your fax and voice messages from any touchtone phone and also have your email messages and faxes forwarded to you as email attachments. 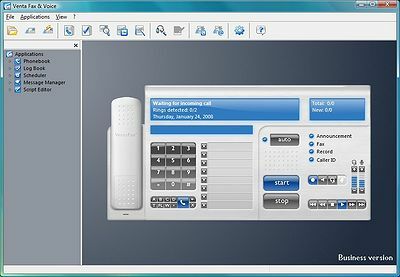 VentaFax also supports Caller ID (if available) and allows you to record a telephone conversation in one click. The user interface is friendly and intuitive, resembling a regular fax machine with buttons and controls. It even shows you the image of a fax page travelling through this fax machine's slot as you transmit and receive faxes. Ventafax is the one of a handful of software products that supports high-speed (up to 33600 bps) V34 Fax (Super G3) protocol. Ventafax also supports the TTS (Text-To-Speech) engines and will employ them to convert text files to speech. You can keep your announcements and outgoing voice messages as the sound (.WAV) files as well as the text files. Distinctive Ring service (if supported by your modem) is available even in Windows XP! Additional features include support for voice mailboxes, automatic voice/data/fax mode recognition and more. VentaFax is accessible from any Windows application, via a virtual printer driver. Need unlimited automated message delivery? Need mass fax and voice mails broadcasting? Find this and even more in VentaFax Business version. The Ventafax Business version expands the Home version's functionality with fax and voice messages broadcasting. You can automatically send a fax or voice message to as many destinations as you need. Need more? Multiline Business versions do their job using 2, 4 (up to 32) fax modems simultaneously.